What do New Jersey mobsters have to do with climate change? 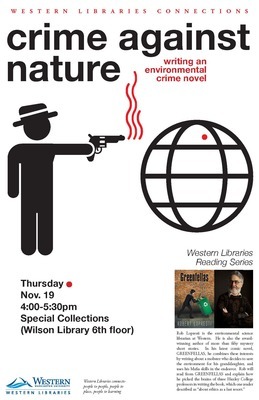 Western Washington University Environmental Science Librarian Rob Lopresti explored this question when he presented “Crime Against Nature: Writing an Environmental Crime Novel,” at 4 p.m. on Thursday, Nov. 19 in Special Collections at Wilson Library. Lopresti is an award-winning author of more than 50 mystery short stories. In his latest comic crime novel, “Greenfellas,” he combines his interest in the environment with his mystery-writing skills to create a story about a mobster who decides to save the environment for his granddaughter. At the event, Lopresti will read from Greenfellas and explain the what his process was for writing the book.